Produce Packing plants, which serve as a collection center for fruits and vegetables prior to distribution can be operating at 110% one month and nearly closed down entirely another. Our battery scrubbers' fully accessible recovery tank, allows for unsurpassed sanitation and disinfecting of the recovery (dirty) tank. The Tomcat scrubbers are used to recover the fluid spills from the many Wash Baths that are required, and also clean up the soil tracked around by the material handling vehicles. The facilities develop strategies for Sorting/Trimming, Washing, Drying, Waxing, Curing, Chemical Treatments, Grading, Packaging, Pre-cooling, Storage and Transportation, with each creating unique requirements on the floor scrubber or floor sweepers. The larger packing plants will use rider scrubbers to tackle the floor scrubbing task in minimum time, and often employ smaller walk behind scrubbers for the congested areas in the building. Multiple operators are common, so simple controls on the scrubber are necessary, as is the ability to quickly clean up after use. 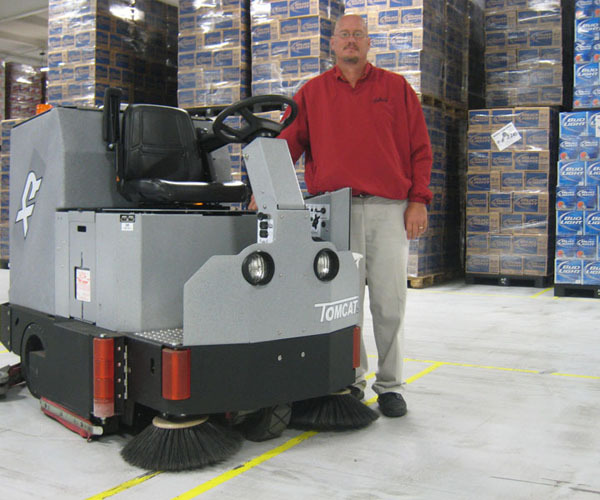 Tomcat sweepers and scrubbers come with automatic chargers, making recharge easy and reliable. The scrubber/sweeper combination machines are popular, as they can sweep and scrub in a single pass, reducing clogged vacuum hoses and streaks on the floor.